On VersionEye you can follow a software library and as soon the next version comes out you will receive an email notification. We don’t spam you. We send you 1 email per day with all the notifications to the software libraries you follow directly. Now we changed the format a little bit. In the new email format we not only show you the new version, but also in which of your projects the software libraries is used. Here is an example how the new email looks like. 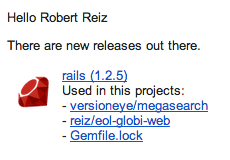 Of course this only works if VersionEye is monitoring some of your GitHub repositories. Let us know how you like this new feature.